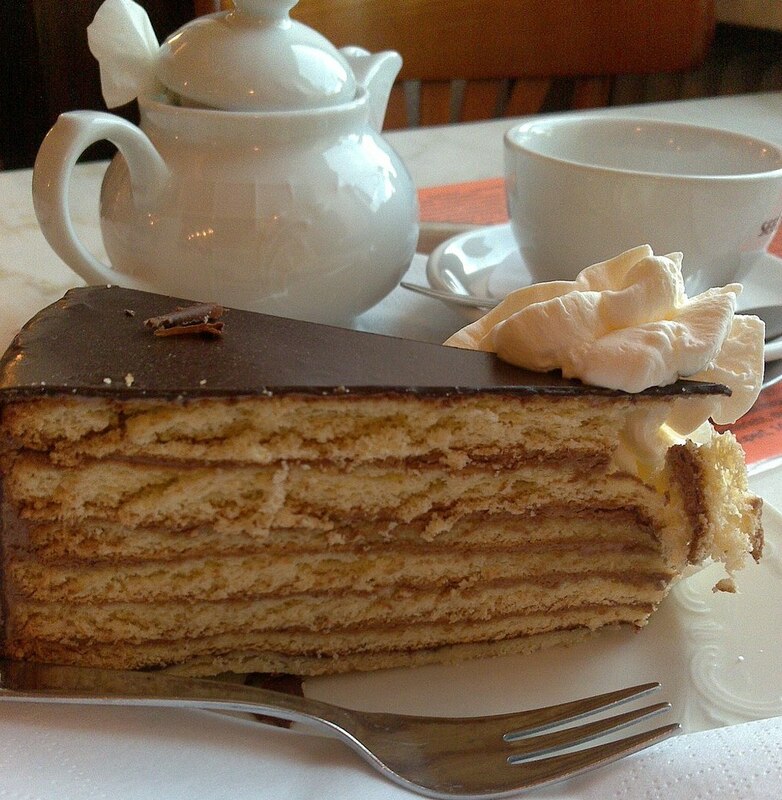 The Prinzregententorte Bavarian Layered Chocolate Cake is a very traditional cake with quite some history. The cake consists of eight thin layers made out of a biscuit and chocolate butter creme all surrounded by a glaze of chocolate. The origin is Munich, the capital of Bavaria. Why the name Prinzregententorte? It comes from two words: Prinz = prince and Regent = archon or regent. The cake was made to honor Prinzregent Luitpold (successor of king Ludwig II) who was in charge of the kingdom Bavaria in 1886. Local confectioner Heinrich Georg Erbshäuser had his own confectionary since 1875 and when Luitpold celebrated his 65th birthday, a special cake was ordered. This cake consisted of 8 layers which symbolized the eight Bavarian districts that were under his reign. Confectioner Erbshäuser became the purveyor to the court in 1890. Two years after Erbshäuser's death a baker named Anton Seidl re-created the cake and since then this cake is a symbol of Bavaria. To bake the cake might sound complicated. It's not that bad as you can bake 2 biscuit layers at the same time in the oven. Happy Baking! - Mix pudding powder with cocoa, 75 g sugar and 100ml milk. - Bring 400 ml milk to a boil. Remove from stove. - Mix in the powder and let cook for 1 min while stirring continuously. - Pour pudding in a bowl and cover with plastic foil right away (prevents skin building). - Beat egg white until firm. - Combine firm egg white carefully with 150 g sugar, vanilla sugar and salt. Mix well with a spoon. - Mix in egg yolks. - Sieve the flour and carefully fold in the dough. - Grease a 26cm springform with butter. - Place 5-6 Tbsp of dough evenly on the bottom of the form. Make sure the edges are not thinner than in the middle. - Bake on lowest grid in pre-heated oven for 5-6 min on 225C or 425 F (convection 200 C or 390 F). If you see the edges are getting brown remove it fast from oven. - Remove it right away from the form with a long thin knife. If you wait too long the biscuit will get hard and breaks when removing it. - Do this now 5 times as you need 6 thin biscuit layers (This recipe is using 6 layers), and the last layer must be a biscuit! - Beat butter creamy, add spoon by spoon the pudding. Important: Butter and pudding must have room temperature! - Spread a thin layer of cream on the first layer, place the other layer on top, spread the cream evenly on it and so on. At last spread the cream all around the cake; best is to use a wide knife. - Place cake in the fridge for at least 3 hours or over night. - Melt chopped chocolate and oil in a double boiler until it is melted. Pour over the cake and spread evenly all around the edges. Bring cream and butter to a boil. Place chocolate in a bowl. Pour over the chocolate and let sit for some minutes until chocolate has melted. Mix well, then pour over the cake. It's easy when the cake sits on a lazy susan, so you can turn it to spread the glaze evenly.